Overview the most common and important cardiovascular symptom. It is also a very important symptom for the lungs and oesophagus, where the character, pattern of pain and associated symptoms differ. 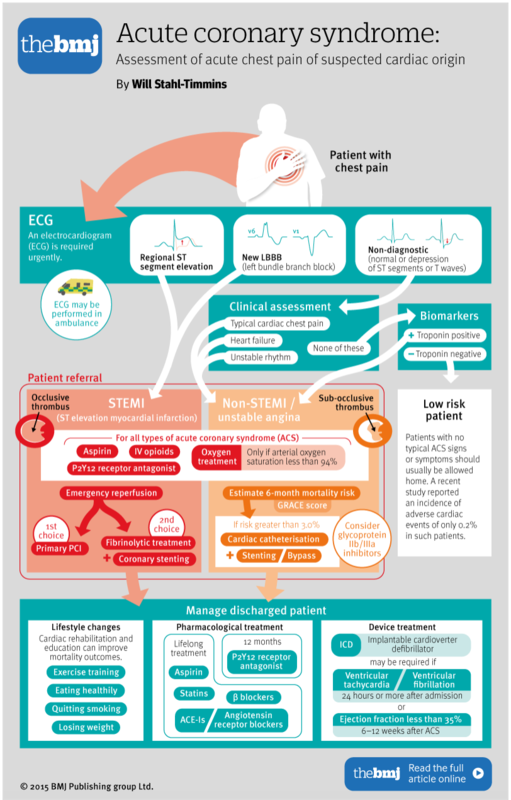 Initial management include oxygen, analgesia, nitrates (to rule in MI) and investigations with ECG and chest X-ray are urgent for patients who present with chest pain + grave signs and symptoms such as diaphoresis, tachycardia, hypotension, fever and sudden dyspnea. You want to rule out life-threatening causes first which are discussed below. Pleuritic Pain – pain from parietal pleura and endothoracic fascia (the visceral pleura is insensitive to pain). It is worse on inspiration, reflecting the stretching of inflamed parietal pleura during movement of the thorax. No relief with GTN and does not radiate. Pulmonary (Lung parenchymal) Pain – Dull and constant pain. 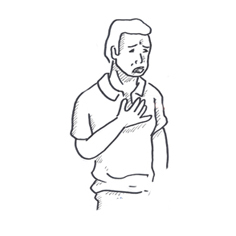 Diaphragmatic pain – pain referred to the shoulder tips. If pain located in costal parts of the diaphragm it radiates to the abdomen. Chest wall (musculoskeletal) pain – It is rarely severe and incapacitating, is often bilateral, and generally is intensified by changes in body position or flexing the thorax. Confused with pleuritic pain. Tender to touch. Burning pain – Esophageal disease, frequently after eating. Acid reflux may worsen with recumbency. Worse when lying supine and relieved somewhat when leaning forward. It may also worsen with deep inspiration. GTN can alleviate pain (because it is a smooth muscle relaxant). However, it takes about 20min whereas in angina GTB works in a few minutes. Worse lying supine, relieved leaning forward. Worse on inspiration Large globular heart (Cardiac Tamponade) Initial diffuse elevated ST segments ± depressed PR segment. 2-5 days later ST isoelectric with T wave flattening and inversion. Remember Approximately 90 percent of patients with aortic dissection will have some CXR abnormality. The classic findings of a widened mediastinum or aortic knob occur in up to 76 percent of patients.